The Alderman Horace Hird of Bradford collection of Wesleyana displayed at Mount Zion, is of outstanding national and international importance both in the history of Wesley and early Methodism and the potter's art and the decorative arts. It consists of pottery busts made from the model made from life in 1781 by Enoch Wood, the finest model maker of his day. The collection also contains figures, ceramics and prints of Rev. John Wesley and his contemporaries as well as Victorian and other religious personalities. Alderman Hird was born in 1900 into a family of steeplejacks. His grandfather, father, brother and nephew were all in the steeplejack business. Like his forbears he started his own business H. Hird (Steeplejack)Ltd. of Bradford and Leeds shortly after he left school at 13. The business flourished until it was voluntarily wound up in 1964. Alderman Hird was the principal director until 1962. His eldest daughter Alys Audrey Hird was the Company Secretary. In 1925 Horace Hird married Alice Hartley (1896-1951) the daughter of Mr. and Mrs. J. H. Hartley of Bradford, later of Torquay and they lived at Fern Royd, 5 North Park Road, Bradford. They had three daughters, Alys Audrey, Freda and Pauline. Before his marriage Horace was a member of the Victoria Hall Mission in the Otley Road Methodist Circuit. He held many offices in both the Sunday School and the Church. Alice was a member of Eastbrook Hall Methodist Mission, Bradford. Later they became active members of Frizinghall Methodist Church where Horace was a trustee. Outside his business Horace Hird had a wide range of interests. In 1944 he was elected to the City of Bradford Council as a Conservative representative for the Heaton Ward. In 1949 he was elected an alderman. It is a mark of the respect with which his fellow councillors held him when in 1951 after less than 7 years on the council they unanimously invited him as the Conservative and National Liberal Lord Mayoral nominee and elected him as the Lord Mayor. He served on several council committees and was the chairman of the Libraries, Art Gallery and Museum Committee. His "Lord Mayor's Appeal" which was to raise some £15,000 was for the Ernest Ayliffe Home for the Aged Deaf and Dumb at Rawson. He appointed a lay person to be his mayor's chaplain (unique in the 1950's). His chaplain was Dr. Clifford W. Towlson MA, BD, the former Head of Woodhouse Grove School and the Vice President of the Methodist Conference. 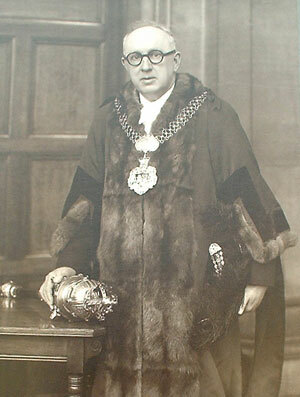 He continued to serve on the Bradford City Council until 1971. His wife, Alice, who had always taken a keen interest in his Christian, charitable, political and cultural interests became his Lady Mayoress and it was a great shock to both the family, the Methodist people, the councillors and the people of Bradford when on the 7th December, 1951 after speaking at Bradford Ladies Circle about Bradford's history and achievements she was taken ill and within a few hours died. At the time her husband was in Norfolk on business. Miss Alys Audrey Hird followed her mother as the Lady Mayoress. At 22 she was the youngest ever Bradford City Lady Mayoress. Mrs. Hird's funeral was held at Eastbrook Hall, Bradford, with the Lord Mayor's Chaplain and the Rev. Maurice Barnett conducting the service. Alderman Hird was the president of the Bradford Branch of the Royal National Lifeboat Institute, which raised money for the City of Bradford Lifeboat III stationed at the mouth of the Humber. In July, 1956 Alderman Hird was married to Mrs. Dorothy Drennan Balmforth (1898-1977), of Grange Park Drive, Bingley, at All Saints Parish Church, Bingley, by the Bishop of Bradford, Rt. Rev. Dr. F. Donald Coggan. Dorothy was the daughter of the former Mr. and Mrs. Charles Hall, who were farmers. Alderman and Mrs. Hird went to live at 30 Haworth Road, Heaton, Bradford. In addition to his many interests for over 30 years he was an avid collector of coins, trade tokens, and memorabilia of Rev. John Wesley, Wesleyan and Methodist Leaders and the various branches of the Methodist Church. In 1953 Oxford University conferred on Alderman Hird an honorary Master of Arts degree in recognition of his knowledge as an antiquarian and as a tribute to his generosity. In 1957 his knowledge and generosity was again recognised when he was elected as a Master of the Court of the University of Leeds. Alderman Hird had a 'critical knowledge' of 17th century tradesman's tokens. He was a Fellow of the Society of Antiquaries and a Fellow of the Royal Numismatic Society. He was also the President of the Bradford Historical and Antiquarian Society and the Yorkshire Numismatic Society and a member of the Wesley Historical Society in whose proceedings he had a number of articles published. He gave the Ashmolean Museum, Oxford, his valuable collection of ancient Scottish coins and early English bank notes. In 1957 he gave to the University of Leeds over 1000 coins dating from the Iron Age to King William IV and his collection of 17th century tokens associated with Yorkshire and Derbyshire. In 1977 his widow left in his memory to the Methodist Conference his collection of Wesleyana, which is now housed at Mount Zion Methodist Church and Heritage Centre, Ogden, Halifax. Alderman Hird wrote and published 3 books. In 1966 How A City Grows - Historical Notes of Bradford and its Corporation (A detailed history from the perspective of the local government 1882 to 1966) it is considered to be the most important book of its kind since William Cudworth, the Bradford Historian's Book "Historical Notes on the Bradford Corporation" published in 1881. Hird wrote and published in 1968 'Bradford in History' - 24 essays on Life by the Bradford from the Celtic Age to the present day and in 1972 he published 'Bradford Remembrance' - twenty six essays on people or incidents in their lives, which are worthy of remembrance. Alderman Hird had been a member of Bradford City Council for 27 years when he retired in 1971. He died at the age of 73 in June, 1973. His funeral was held at Eastbrook Hall Methodist Mission and was conducted by Rev. George S. Beck Superintendent of the Bradford Methodist Mission. In addition to Mr. Hird's family and friends other mourners included the Lord Mayor and Lady Mayoress of Bradford, Alderman Derek Smith and Mrs. Smith along with members and senior officers of the City of Bradford Council and representatives of the organizations he had been associated with. Alderman Hird had one of the finest private collections of Wesleyana, which he had collected for more than 30 yerars. After he died his widow kept the collection until she went into a nursing home. For a number of years the collection was put in store. In Mrs Hird's will she left the collection to the Methodist Conference in memory of her husband. The collection came into the possession of the Methodist Church Archives and History Committee in 1983 and was kept in store until the collection was transferred to Mount Zion Methodist Church, Ogden, Halifax in July 1991. On 26th October, 1991 there was a Service of Dedication held at Mount Zion Methodist Church led by the minister Rev. Stan Brown in which Mr. John Hargreaves told the 'Mount Zion Story', Mr. John Bradley gave a 'Memoir of Horace Hird' and the Rev. Donald H. Ryan, representing the Methodist Church Connexional Archives and History Committee, gave an address on the Hird collection. Rev. Kathleen Richardson, Chair of West Yorkshire, dedicated the display of the Hird Collection. There are many important pieces of the collection on display as well as a reserve collection, which can be viewed by researchers by prior arrangement with Miss Irene Cunliffe. Alongside the Hird Collection is a valuable display of Mount Zion Methodist Church and other Methodist memorabilia including the only known example of a Doulton Tyg (three handled pottery cup) with a lid commemorating the 1897 Centenary of the Methodist New Connexion. It has applied in white relief on a green background, earthenware head and shoulder portraits of three of the Connexional Leaders --Rev. Alexander Kilham (1762-1798), Rev. Dr. William Cooke (1806-1884) and Rev. Samuel Hulme (1806-1901). The collection was the major part of the exhibition of the British Methodist Church's National 250th Anniversary Celebrations of John Wesley's Conversion at a meeting of a religious society held in Nettleton Court, Aldersgate Street, London, on 24th May, 1738. 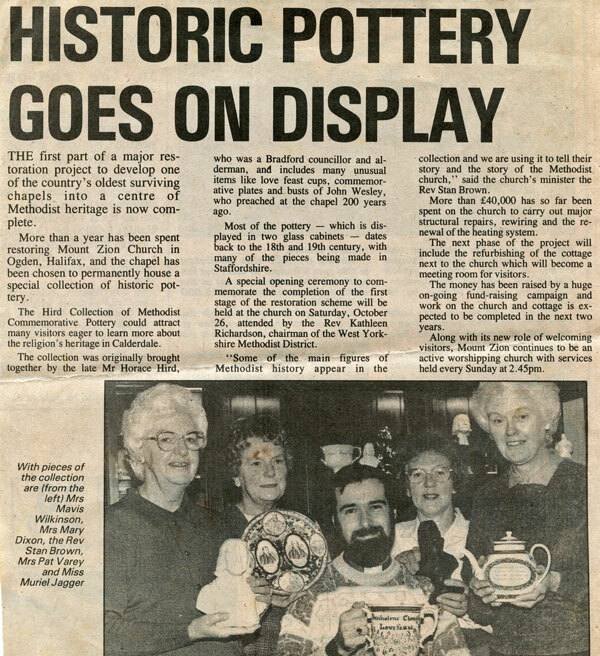 This major exhibition was held at the Potteries Museum, Hanley in 1988. Dr. Oliver A Beckerlegge opened the exhibition, which was chaired by Rev. Donald H. Ryan who gave the opening address. Ms Pat Halfpenny, the museum curator, spoke about the exhibition. Mr. Ryan along with Ms Halfpenny had arranged the exhibition. The Hird Collection and Wesleyana was the subject of a Lecture 'A Brand plucked from the burning' given by Rev. Donald H. Ryan during the 1988 series of lectures at the Potteries Museum,, Hanley, Stoke on Trent. The Hird Collection was the centre of a major Methodist display during the time of the Annual Methodist Conference at Huddersfield in 2000, held in the Art Gallery, Princess Alexandra Walk, Huddersfield during June and July 2000.